Our management team has actively operated most of our properties since 2005, and has a history of exploiting proved reserves to maximize production, primarily through waterflood projects. Over the last eight years, we identified, initiated, acquired, formed and developed over 25% of all new waterflood projects in the State of Oklahoma, while the next most active competitor formed only 7% of all new waterfloods. Approximately 99% of our properties were being produced under waterflood, on a Boe basis. Furthermore, our experience in the Mid-Continent allows us to exploit synergies developed by applying knowledge of field, reservoir and play characteristics across the region. When an oil field is first produced, the oil typically is recovered as a result of expansion of reservoir fluids which are naturally pressured within the producing formation. The only natural force present to move the oil through the reservoir rock to the wellbore is the pressure differential between the higher pressure in the rock formation and the lower pressure in the producing wellbore. Various types of pumps are often used to reduce pressure in the wellbore, thereby increasing the pressure differential. At the same time, there are many factors that act to impede the flow of oil, depending on the nature of the formation and fluid properties, such as pressure, permeability, viscosity and water saturation. This stage of production, referred to as "primary recovery," recovers only a small fraction of the oil originally in place in a producing formation, typically ranging from 10% to 25%. After the primary recovery phase many, but not all, oil fields respond positively to "secondary recovery" techniques in which external fluids are injected into a reservoir to increase reservoir pressure and to displace oil towards the wellbore. Secondary recovery techniques often result in increases in production and reserves above primary recovery. 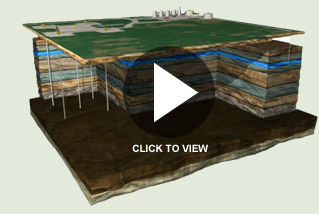 Waterflooding, a form of secondary recovery, works by repressuring a reservoir through water injection and "sweeping" or pushing oil to producing wellbores. The water used for injection is brackish, non-potable water that is co-produced with the oil or obtained by drilling a well into a water bearing formation. Through waterflooding, water injection replaces the loss of reservoir pressure caused by the primary production of oil and gas, which is often referred to as "pressure depletion" or "reservoir voidage." The degree to which reservoir voidage has been replaced through water injection is known as "reservoir fill up" or, simply as "fill up." A reservoir which has had all of the produced fluids replaced by injection is at 100% fill up. In general, peak oil production from a waterflood typically occurs at 100% fill up. Estimating the percentage of fill up which has occurred, or when a reservoir is 100% filled up, is subject to a wide variety of engineering and geologic uncertainties. As a result of the water used in a waterflood, produced fluids contain both water and oil, with the relative amount of water increasing over time. Surface equipment is used to separate the oil from the water, with the oil going to pipelines or holding tanks for sale and the water being recycled to the injection facilities. In general, in the Mid-Continent region, a secondary recovery project may produce an additional 10% to 20% of the oil originally in place in a reservoir. 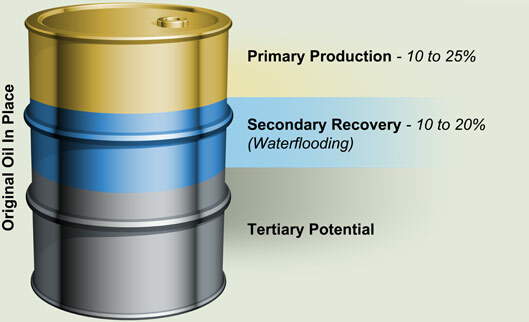 A third stage of oil recovery is called "tertiary recovery." In addition to maintaining reservoir pressure, this type of recovery seeks to alter the properties of the oil in ways that facilitate additional production. The three major types of tertiary recovery are chemical flooding, thermal recovery (such as a steamflood) and miscible displacement involving carbon dioxide (CO2), hydrocarbon or nitrogen injection. We are currently field testing new technologies in chemical flooding on some of our properties. If successful, this testing may lead to reserve and production increases in the future. Any future tertiary development programs and subsequent capital expenditures would be contingent upon commercial viability established by successful pilot testing. At this time there are no estimated reserves or production associated with tertiary recovery projects assigned to our properties. We will continue to review future opportunities for growth through the use of various tertiary recovery techniques. © 2014 Mid-Con Energy Partners, LP. All rights reserved.